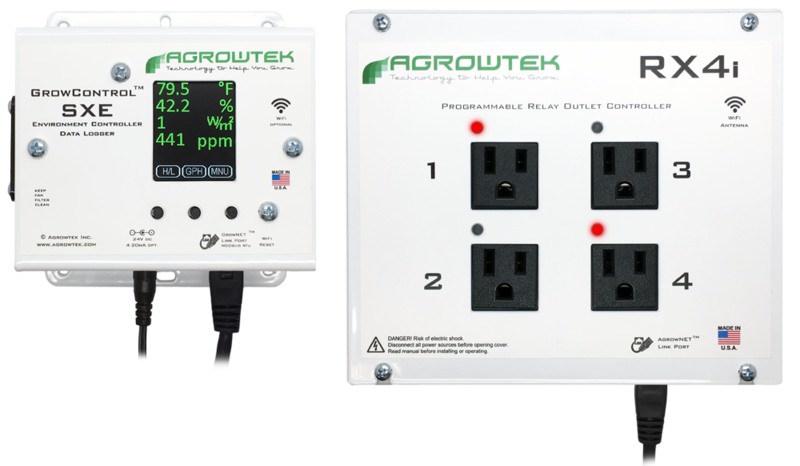 GrowControlTM MCX4 climate controller combines Agrowktek's SXE environment sensor/controller with an RX4i intelligent four-outlet relay to form a powerful, autonomous environmental controller for a single basic zone. Sense and control temperature, humidity and CO2 with day and night set points. Each of the 120V outlets can be programmed independently for a specific sensor-based control, 24-hour timer and cycle timer. A light sensor on the top of the SXE controller detects day or night from ambient light levels. Precision sensors and rugged relays offer reliable and accurate control of environments large and small in an economical, easy to use package. Built on a decade of proven technology and components with new, enhanced capabilities to meet the growing demand for highly reliable environmental control applications. RX4i relay includes four independent, programmable 120V outlets. Upgrade the MCX4 system to include a CO2 ppm sensor module to monitor and control CO2. The RX4i has knock-outs for connecting to conduit, or choose the power cord kit with 6ft 14awg plug cord & grommet..